The FIA's latest attempt at cockpit protection in Formula One will make its public debut on July 14. In an effort to get driver feedback while making refinements to the design, the Formula One cockpit protecting shield will make its on-track debut at Silverstone, the FIA said in a press release. The shield will be run on a Ferrari during Friday Free Practice One at the British Grand Prix. The shield is being developed by the teams and the FIA. It is currently undergoing off-track testing ahead of its official first track test which is scheduled to be at Monza during the Italian Grand Prix in September. The FIA released a rendering of what the clear polycarbonate cockpit protector is looking like in the design phase. While it may look odd, its arrival is inevitable, though it will probably be refined considerably as it gets closer to completion. The long, sleek shield is a vast departure the Halo and Red Bull's Aeroscreen that showed up a few times for on-track testing in the recent past. The shield concept seems to integrate with the car in a more aerodynamic friendly manner. While it isn't a perfect solution, the shield is the best option that has been presented so far, and the best looking. Of course, the shield still has to actually work and get approval before it becomes mandated on the cars for 2018. The FIA has said that some form of cockpit protection will be run on the car next season. 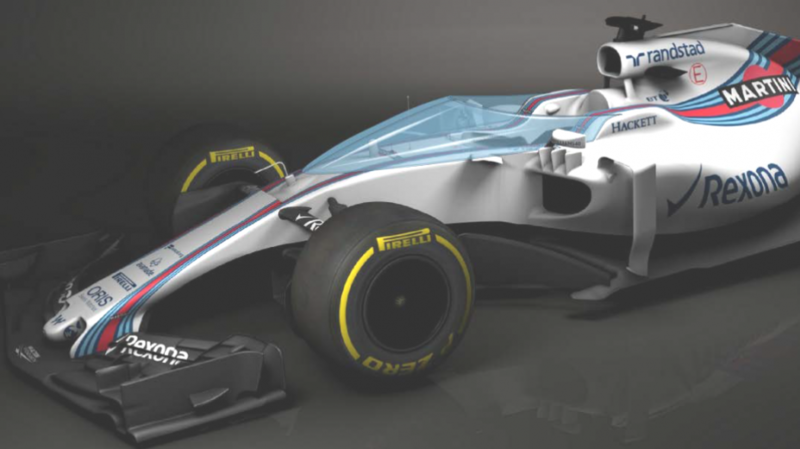 If the shield does not perform as expected, the FIA may still move forward with the Halo. Ferrari's "halo" device set to be mandated for 2017.